January 30, 1925: Frances (Judy) interrupted an Amateur Night at her father’s theater, the New Grand Theater, in Grand Rapids, Minnesota. She repeated her performance from December 26, 1924, during which she sang chorus after chorus of “Jingle Bells.” When she came on again at the finale of this show, the audience declared her the winner, though her father, Frank Gumm, as the owner of the theater, didn’t allow her to accept the award. 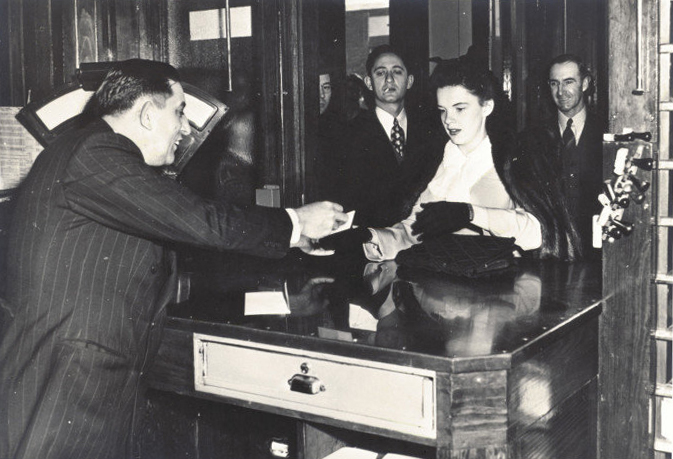 January 30, 1938: Judy was on her way back to Los Angeles, California, from Miami, Florida, and the premiere of Everybody Sing when her train stopped in El Paso, Texas, where she signed autographs. 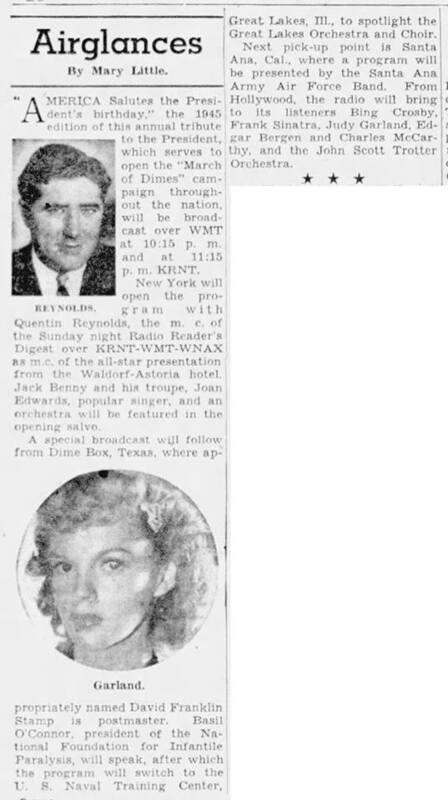 January 30, 1940: Judy’s weekly appearance on NBC Radio’s “The Pepsodent Show Starring Bob Hope.” No other information about the show, or what Judy sang, is know. No recording exists. Also on this day, two news items were printed. 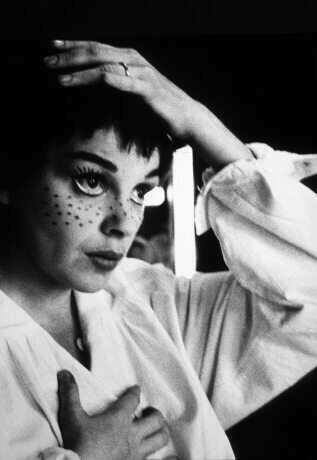 The first item notes that Judy was given the chance to sing on the stage of New York’s Metropolitan Opera House. 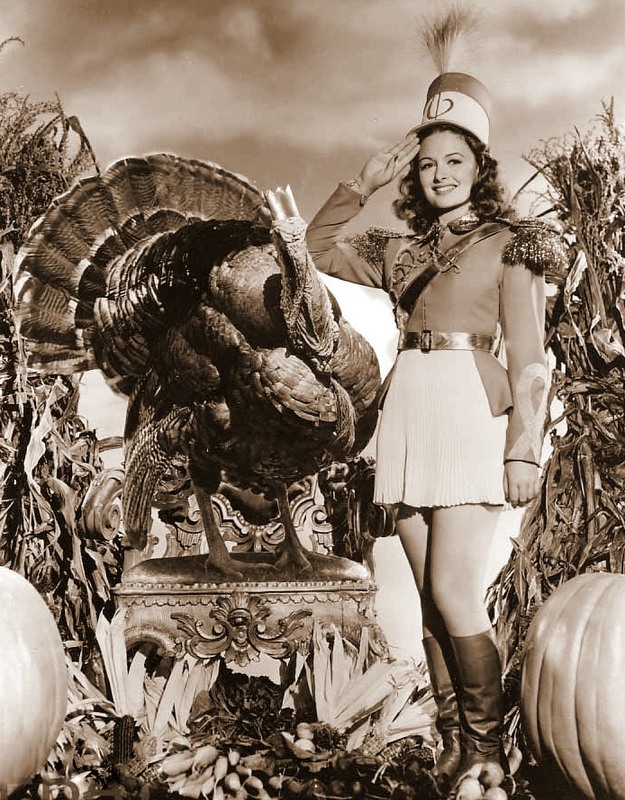 If this really happened, it would have taken place that previous August when she and Mickey Rooney were in the city for the premiere of The Wizard of Oz. 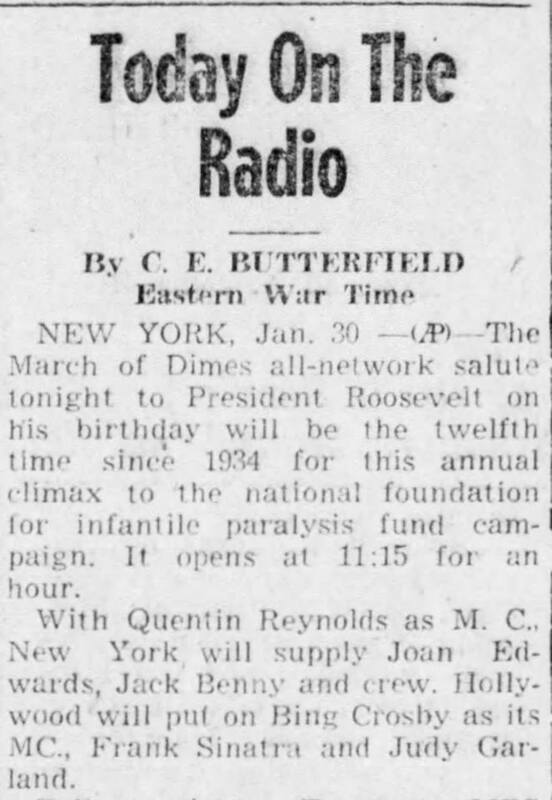 January 30, 1941: According to this article, the baton that Judy wielded in the deleted “We Must Have Music” number in Ziegfeld Girl was her own baton from childhood and allegedly the same baton she used in Pigskin Parade but she didn’t use any baton in the latter film, co-star Tony Martin did. 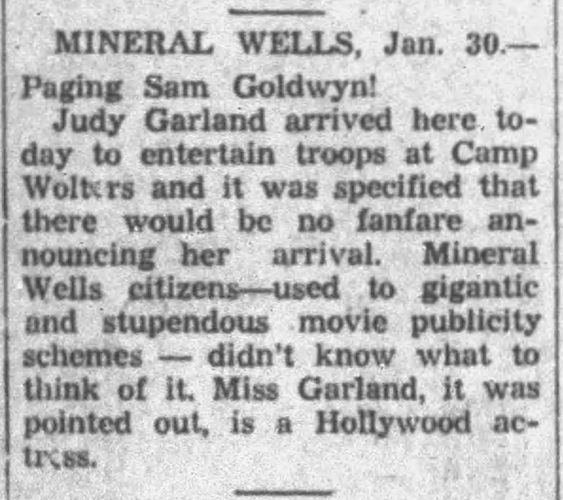 Clearly, this was more fiction provided by MGM’s publicity department to get Judy’s name in the paper and a mention of Ziegfeld Girl. 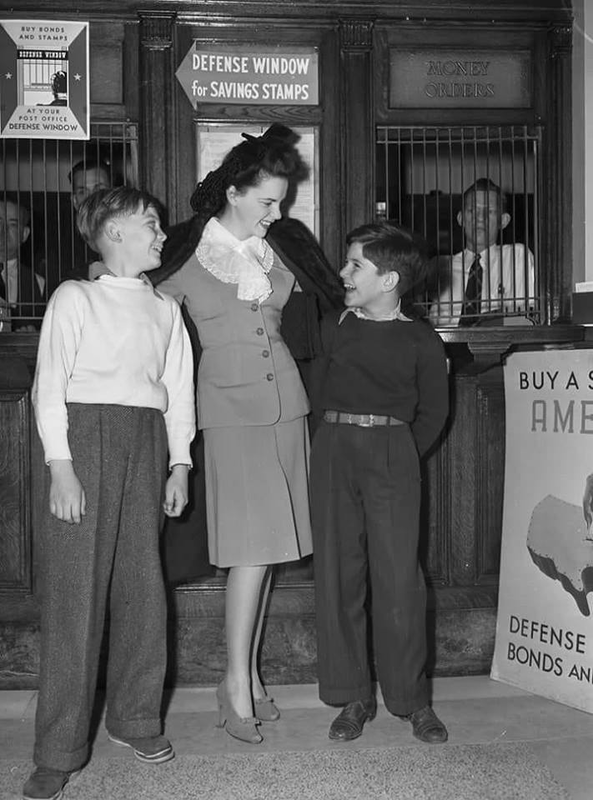 January 30, 1942: Judy arrived at Camp Wolters, in Mineral Wells, Texas, the last stop on her USO tour of Army camps with husband David Rose, mom Ethel, and assistant Baron Poland. 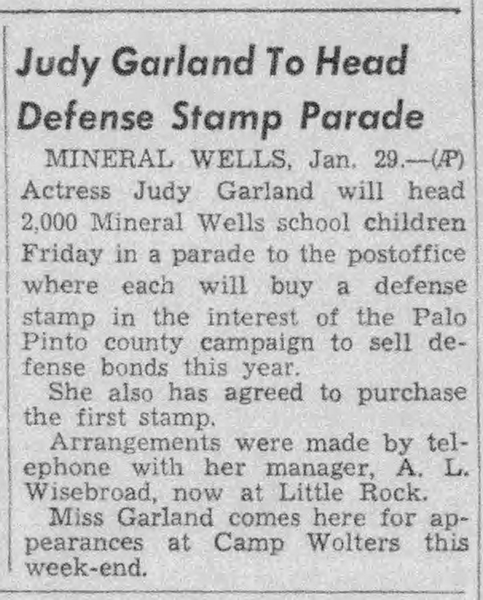 According to the papers, Judy led “2,000 Mineral Wells school children in a parade to the post office where each will buy a defense stamp in the interest of the Palo Pinto county campaign to sell defense bonds…” Judy bought the first stamp. 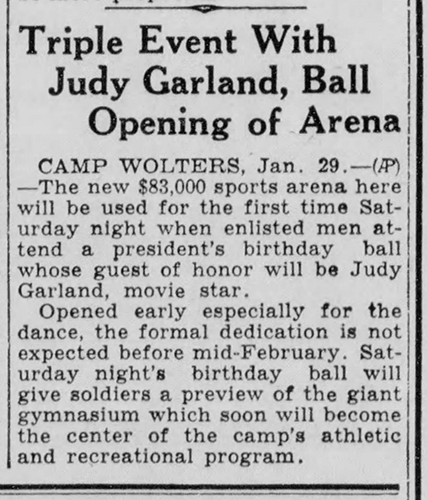 On January 31st, Judy performed at the new $83,000 sports arena as the special guest of honor at a dance for the enlisted men and in honor of President Roosevelt’s birthday. 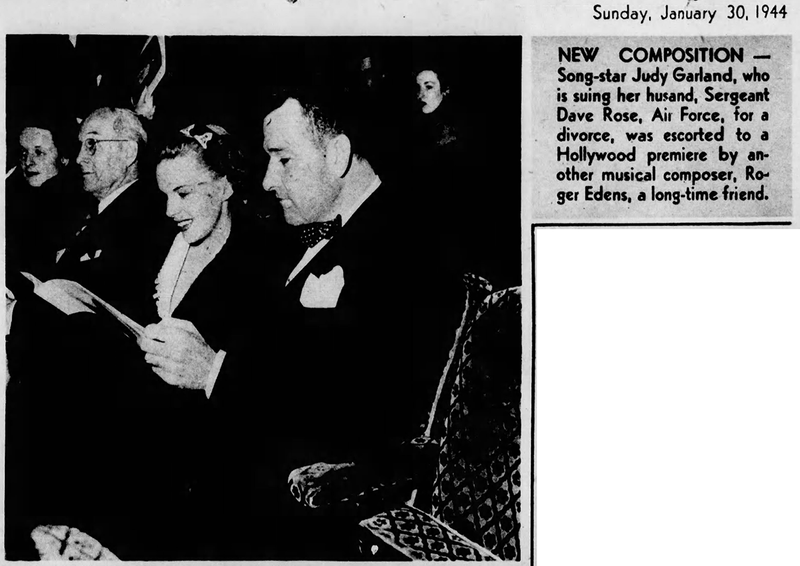 January 30, 1944: This photo of Judy and Roger Edens at a recent premiere made Nat Dillinger’s “Inside Hollywood” photo column. 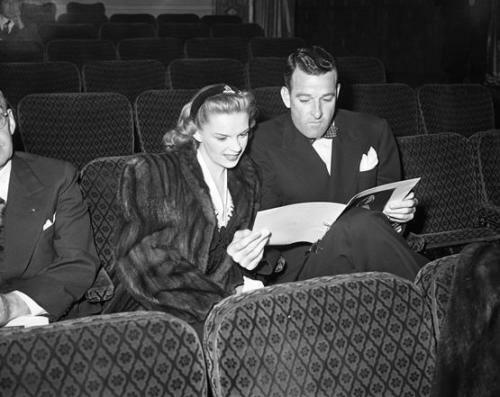 Also included above is another shot of Judy and Edens at the same premiere. 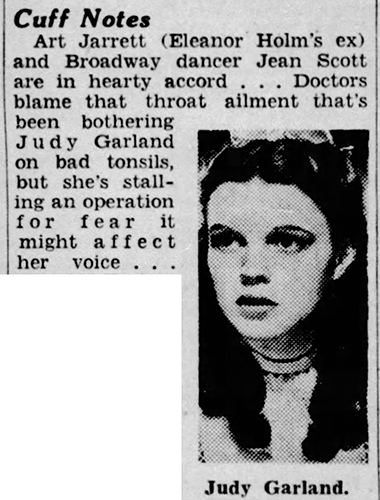 January 30, 1945: Judy in the news. 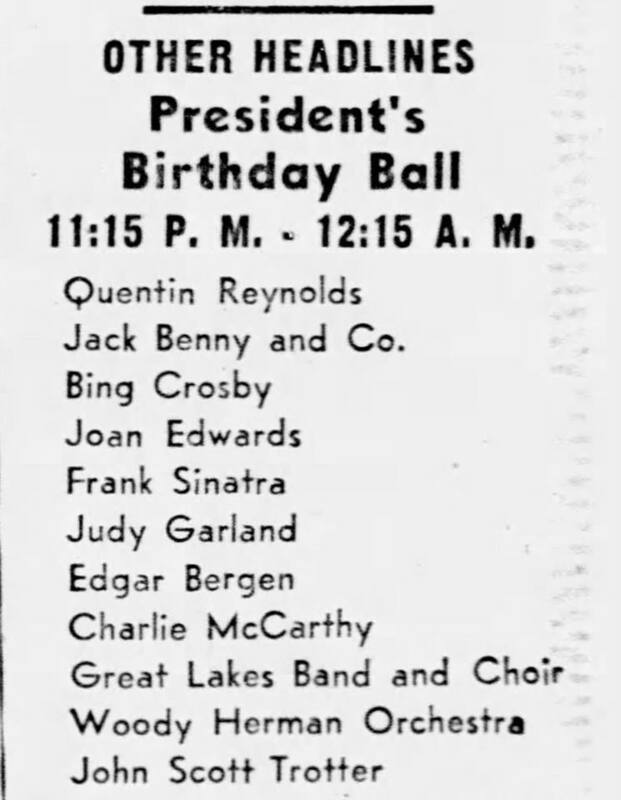 The first is from Erksine Johnson’s column in which he reports on Judy’s habitual tardiness to the set and how producer Arthur Freed played a joke on her when she actually showed up on time. 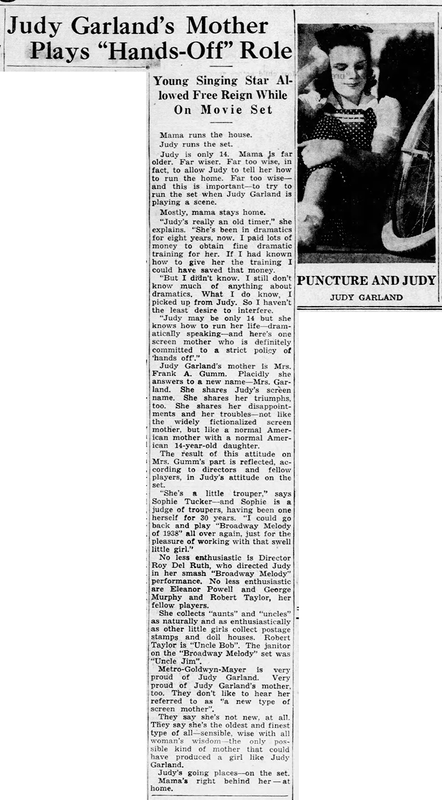 Apparently, Judy had a well-known reputation for being late, enough so for Johnson to provide an anecdote about it. 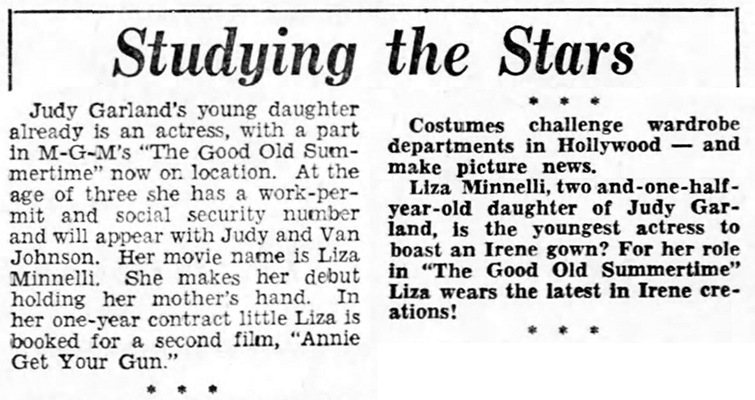 The second clipping reports that Judy and director Vincente Minnelli were set to wed early that fall. The couple didn’t wait that long. They were married on June 15, 1945. 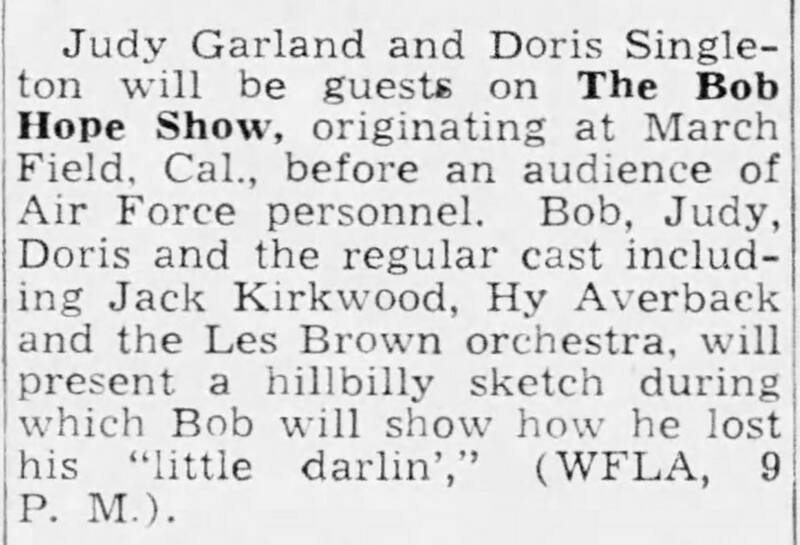 The other clippings are for the San Francisco, California, engagement of Meet Me In St. Louis, which was still a huge hit around the country. 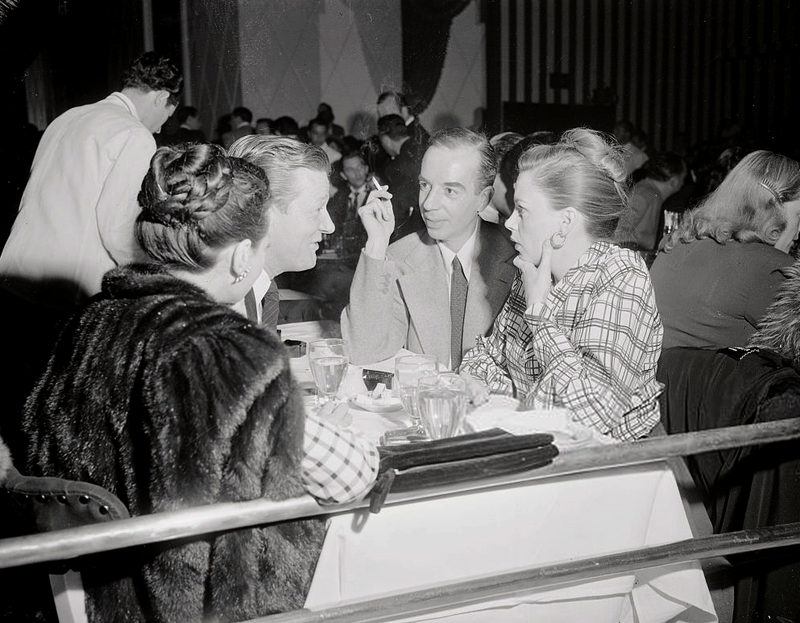 Sylvia Sidney and her husband Carlton Alsop, at left, join with Judy Garland and her husband, Vincente Minnelli at a Hollywood night club for a discussion of careers. Both woman have interesting hobbies in addition to their screen work. Miss Sydney has decorated her home with her hand-hooked rugs and furniture which she has refinished while Miss Garland has written two book of poetry and dabbles in painting. 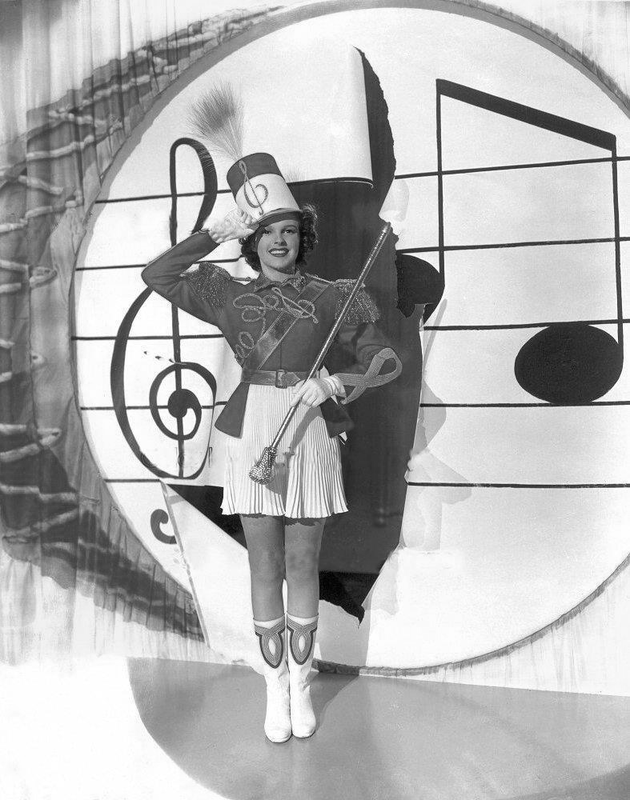 Judy spent the day at MGM filming scenes for Easter Parade on the “Interior Vaudeville Theater Backstage” and “Interior Don’s Apartment” sets. 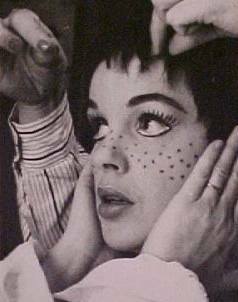 Judy was in makeup at 7 a.m.; she arrived on the set at 9:23 a.m.; dismissed at 5:40 p.m.
January 30, 1949: Judy and Vincente Minnelli’s daughter, Liza Minnelli, got two mentions in this uncredited column titled “Studying the Stars.” It notes Liza’s recent debut in her mom’s film In The Good Old Summertime as well as the rumor that she was to play a role in Annie Get Your Gun. 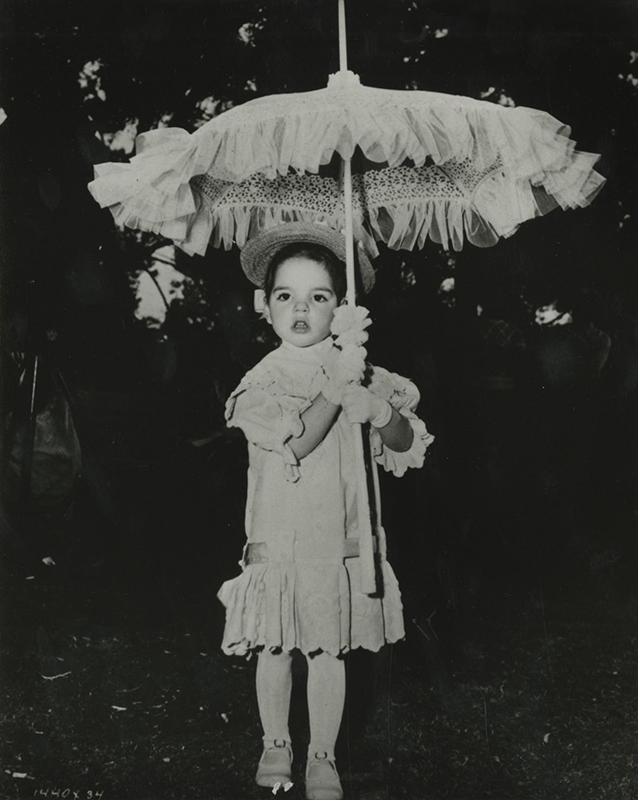 Also noted is the fact that Liza was the youngest actress to wear a costume designed by the famous costume designer Irene. 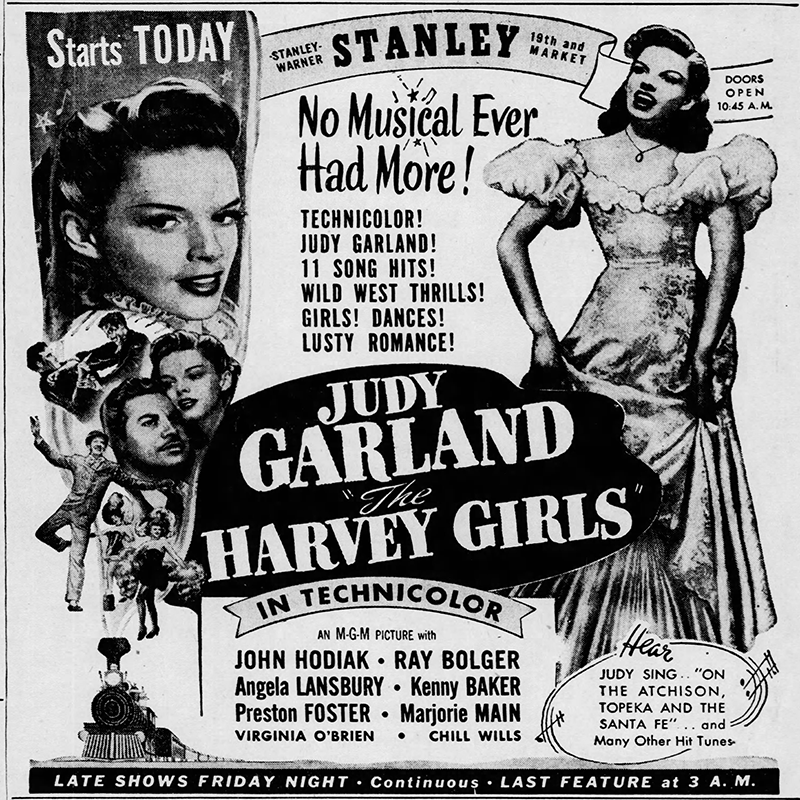 Also on the day, Judy fans in Sedalia, Missouri, were treated to almost a full page of Judy Garland in the local paper. 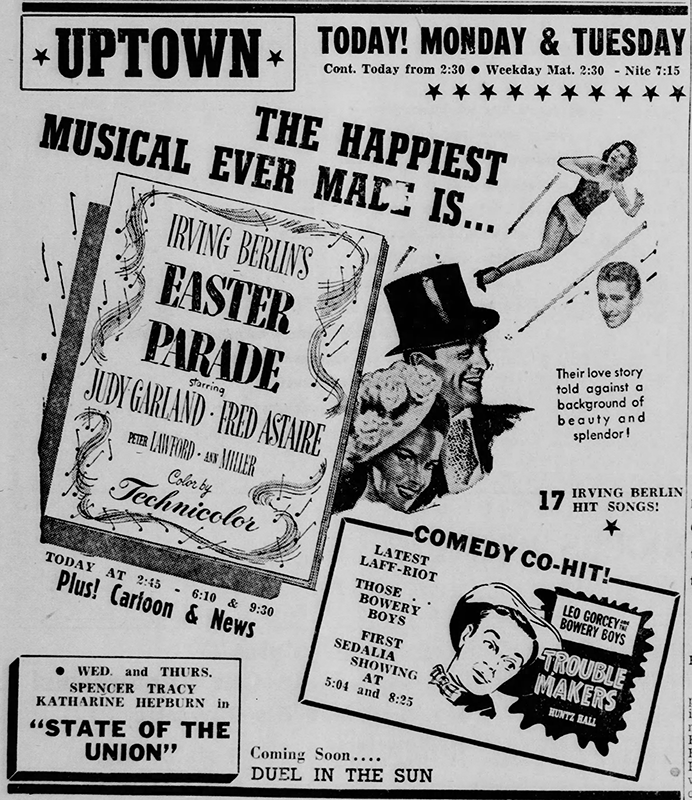 Both Words and Music and Easter Parade were showing locally. 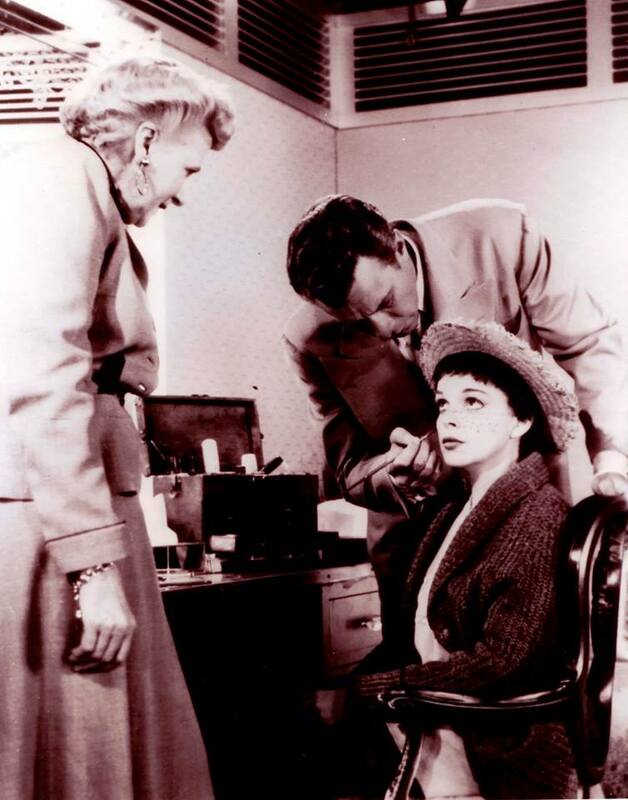 There were also rumors that Judy would star with Ezio Pinza in “Slightly Dishonorable.” Judy was also supposedly thought about for a film version around 1955. “South Pacific” made it to the screen in 1958 with Mitzi Gaynor in the starring role. It’s doubtful that by 1957 when casting would have been decided on (possibly 1956) Judy would have been seriously considered for the film role, chiefly because she wasn’t the Nellie Forbush type anymore. 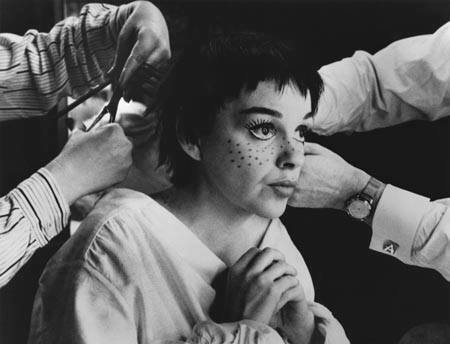 January 30, 1954: A Star Is Born filming continued with the scene on the “Interior Dressing Room” set. This was the very heartwrenching scene with Judy’s “Vicki Lester” pouring her heart out to Charles Bickford’s “Oliver Niles” about James Mason’s “Norman Maine,” between takes of the peppy “Lose That Long Face” number. 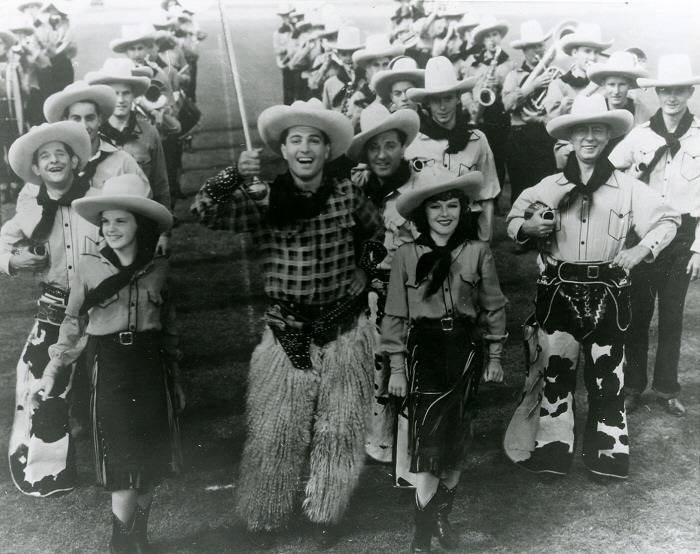 “Lose That Long Face” was cut from the general release print of the film, but the dressing room scene was not. The number, which takes place before the dressing room scene with a short reprise after, was not seen until the restoration of the film in 1983. The scene with the musical number as a framing device is even more powerful than without it. 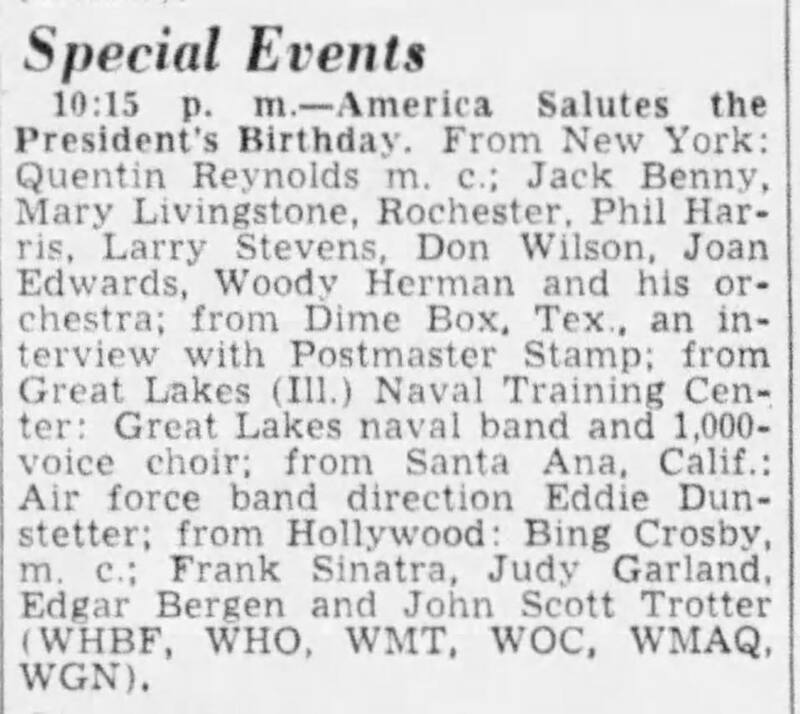 Lucky for us the lost footage for this segment survived and we can all enjoy it as it was intended to be seen by the film’s director, George Cukor. 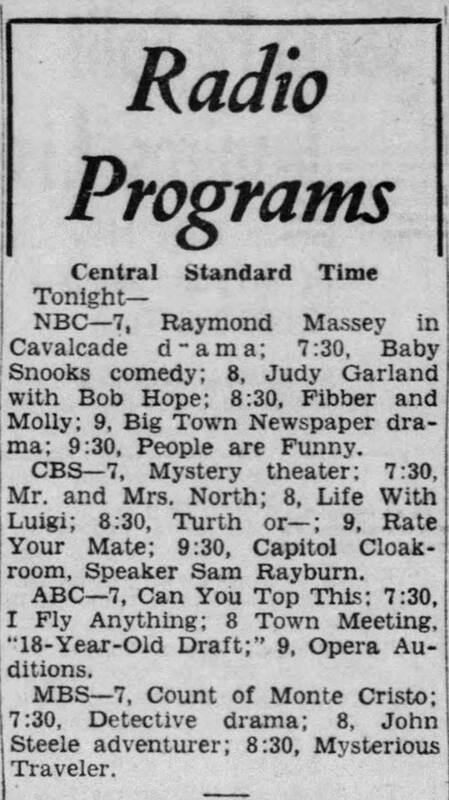 January 30, 1963, to February 3, 1963: Judy, along with Phil Silvers and Robert Goulet, taped her special for CBS TV titled “Judy Garland and Her Guests Phil Silvers and Robert Goulet in New York. 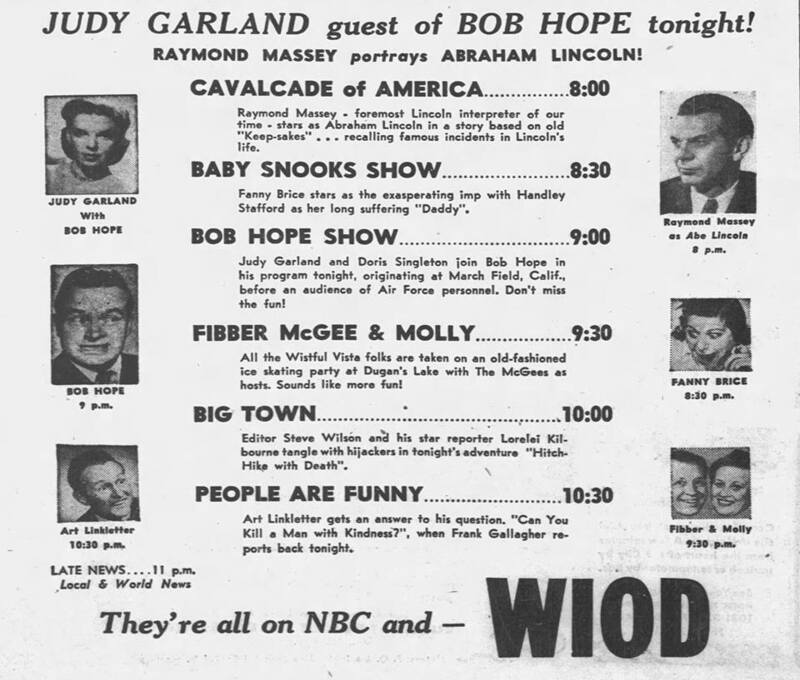 The show aired on March 19, 1963, from 8:30 to 9:30 p.m. and received stellar reviews. 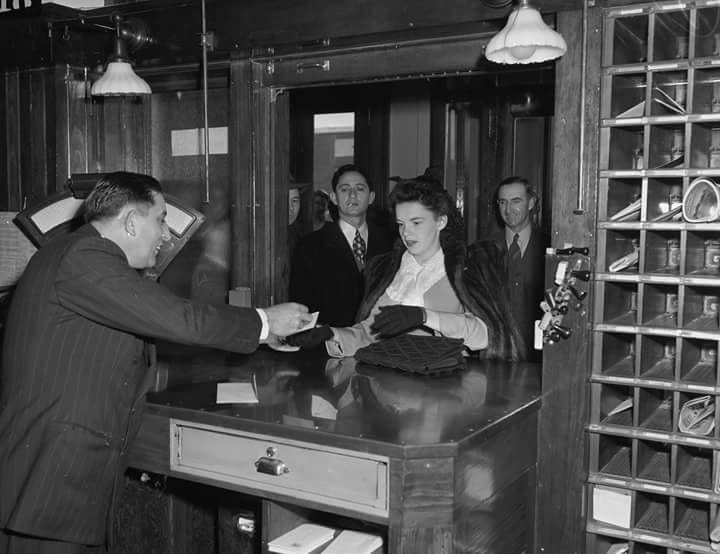 January 30, 1954: Judy wrote a check on her Kings Row Enterprises, Inc., checking account to Clorehea Gland, a member of her household staff, for $96.37. January 30, 1967: Judy and Tom Green again saw “Mame” at the Winter Garden Theater, starring Judy’s The Harvey Girls co-star, Angela Lansbury. Photo above: 1967 snapshot of Judy and Tom Green. Below is a wonderful and unusual ad for The Harvey Girls. 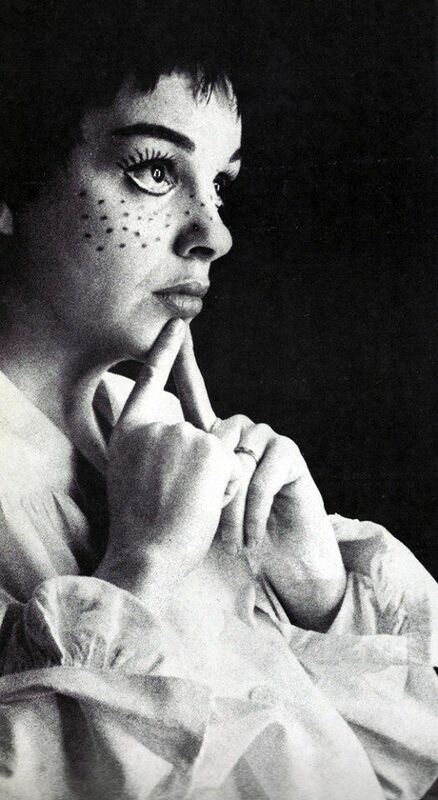 January 30, 1969: Judy had a business meeting at 5:30 p.m. with Bob Colby and Hector (Ettore) Stratta, along with John Meyer, in Judy’s room at the Ritz Hotel in London, England The meeting was held with Mickey Deans to determine what was going to happen about the recording session set for February 4th. Despite the studio being booked, musicians being hired, and Johnny Spence providing the arrangements (Spence had worked with Tom Jones and Engelbert Humperdink), it was decided that after five weeks of signing, Judy would sound better after a month of rest. 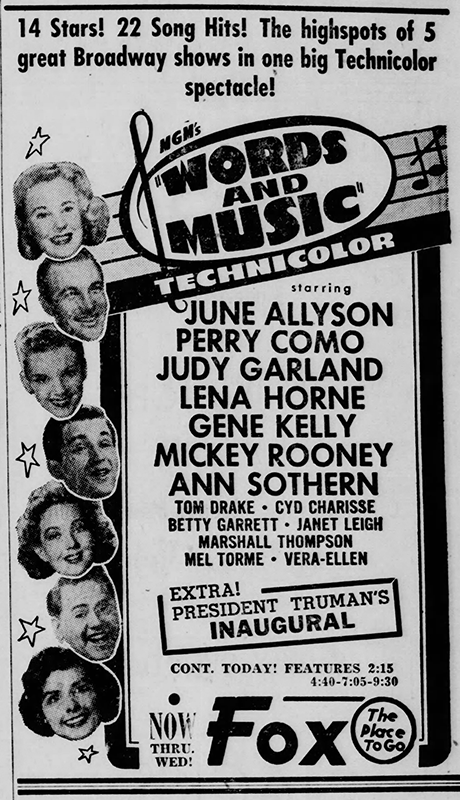 Deans later said that he decided not to accept the offer for Judy to appear in a TV commercial (proposed by TWA Airlines and to feature Judy with Mickey Rooney) because Judy wanted to go to the Virgin Islands. Photo: Judy and Mickey Deans in 1969. Why does Tom Green look so hokey in every picture??? Such a gent. Too bad Judy didn’t snap him up – he would’ve made her so happy!! I think he would have been better than Mickey Deans. Well, to me, it’s six of one, half dozen of the other. I sometimes think Glenn Ford must’ve been the last heterosexual Judy ever dated!